Use Coding Standard with 0-knowledge of PHP-CS-Fixer and PHP_CodeSniffer. Are you already using another tool? Create an easy-coding-standard.yml in your root directory and add Sniffs or Fixers you'd love to use. That would load file always from vendor dir, no matter where you are. What if you add symfony.yml set, but don't like PhpCsFixer\Fixer\PhpTag\BlankLineAfterOpeningTagFixer? Sometimes, checker finds an error in code that inherits from code you can't change. # or multiple files by path to match against "fnmatch()"
Do you need to Include tests, *.php, *.inc or *.phpt files? Normally you want to exclude these files, because they're not common code - they're just test files or dummy fixtures. In case you want to check them as well, you can. Let's say you want to include *.phpt files. Don't forget to autoload it with composer. Use any Finder you like: Nette\Finder or Symfony\Finder. You can also return array of files or SplFileInfos. How can I see all loaded checkers? How do I find checkers by group or type? How can I change the cache directory? Can I use tabs, 2 spaces or "\r\n" line endings? line_ending: "\r\n" # PHP_EOL by default; you can also use "\n"
Go to Preferences > Tools > External Tools and click + to add a new tool. Press Cmd/Ctrl + Shift + A (Find Action), search for ecs, and then hit Enter. It will run ecs for the current file. 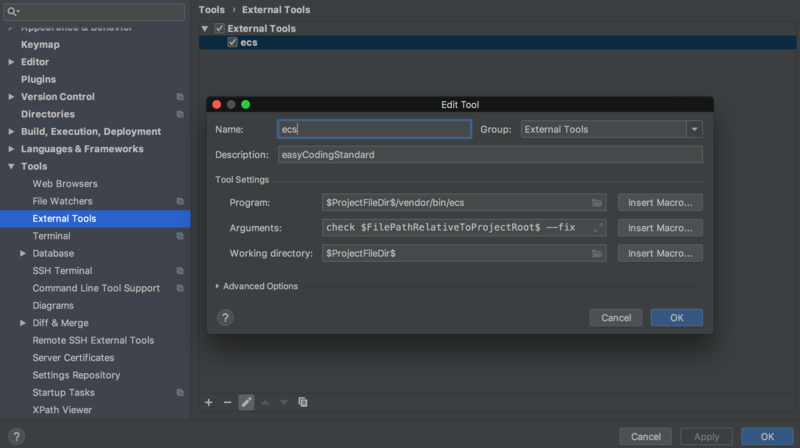 To run ecs on a directory, right click on a folder in the project browser go to external tools and select ecs. You can also create a keyboard shortcut in Preferences > Keymap to run ecs. EasyCodingStandard for Visual Studio Code extension adds support for running EasyCodingStandard inside the editor.